More enterprise data centers are being impacted by a shift to cloud-based hosted service offerings. CIOs have acknowledged that when it comes to commodity x86 servers, the hyperscale service providers are often much better at delivering IT infrastructure for mainstream workloads. With the exception of high-performance computing (HPC) systems and purpose-built mainframes or supercomputers, it's becoming increasing difficult to justify maintaining a corporate data center. Meanwhile, the number of large data centers operated by hyperscale service providers reached the 300 mark in December of 2016, after a flurry of year-end data center openings by the leading providers. One notable feature of the global footprint is that despite a major ongoing push to locate new operations in countries around the world, the U.S. market still accounts for 45 percent of major cloud and internet data center sites, according to the latest worldwide market study by Synergy Research Group (SRG). The next prominent locations are China and Japan, with 8 percent and 7 percent respectively. The three leading countries are then followed by the UK, Australia, Canada, Singapore, Germany and India, each of which accounts for 3-5 percent of the global total. The research is based on an analysis of the data center footprint of 24 of the world’s major cloud and internet service firms, including the largest operators in SaaS, IaaS, PaaS, search, social networking and e-commerce. That said, on average each of the 24 service providers had 13 data center sites. The companies with the broadest data center footprint are the leading cloud providers – AWS, Microsoft and IBM. Each has 40 or more data center locations with at least two in each of the four regions – North America, APAC, EMEA and Latin America. According to the SRG assessment, Google and Oracle also have a notably broad data center presence. The remaining firms tend to have their data centers focused primarily in either the U.S. (Apple, Twitter, Salesforce, Facebook, eBay, LinkedIn, Yahoo) or China (Tencent, Baidu). Previously Alibaba also was focused mainly in China, but it has now opened data centers in the U.S. market, Hong Kong, Singapore, Japan and the UAE. "Hyperscale growth goes on unabated and we are forecasting that hyperscale operators will pass the 400 data center mark by the end of 2018," said John Dinsdale, research director at Synergy Research Group. 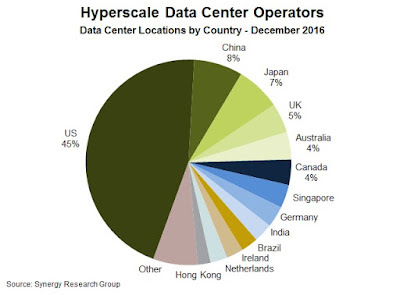 What is remarkable is that the U.S. still accounts for nearly half of all hyperscale data centers, reflecting the American vendor dominance of cloud computing and internet-based technologies. While other countries are now featuring more prominently due to either their scale or the unique characteristics of their local markets, the major players continue to invest heavily in U.S. based data center operations.